Westlife's Nicky Byrne has said he doesn't believe The X Factor will be as good without acid-tongued judge Simon Cowell. And the Herald can reveal how the band's usual slot on the hit show now hangs in the balance since they left the music mogul's record label, SyCo. The chart-topping singer explained how he believed the whole dynamic of the ITV programme will have changed as a result of Simon switching to X Factor USA. "I hear Gary Barlow is good but I can't see it being as good without Simon, if I'm honest, because he and Louis had that banter, that chemistry. I know Louis likes Gary and they get on but I'm not sure if the same chemistry could be had, with anyone," he said. "It doesn't matter who you put in that seat, it's not Simon Cowell. It's nothing against Gary but it's going to be different. And then you've not got Cheryl or Dannii either, so it's not like, you're not just missing one major cog in the wheel it's like 'wow, the whole thing has changed'. But it could be 50 times better, who knows?" The Irish boyband has made countless key appearances on the talent contest, now in its eighth series, which has helped them launch their latest albums to TV audiences of millions. But Nicky explained how the group are no longer assured a key slot on the programme now that they have switched labels to RCA. "I will certainly watch the show but I don't know if we'll be on it. We would all love to, of course and with Louis there thankfully we have an 'in' on it," he continued. "But they have had us on a lot over the years and you have to remember, SyCo is the company that makes the show so hopefully it wouldn't be like that. But you never know, we might not get the show and if we don't, we'll just have to pick ourselves up and move on." The popular singer has also done little to allay speculation that RTE is head-hunting him to co-present new programme The Voice of Ireland. 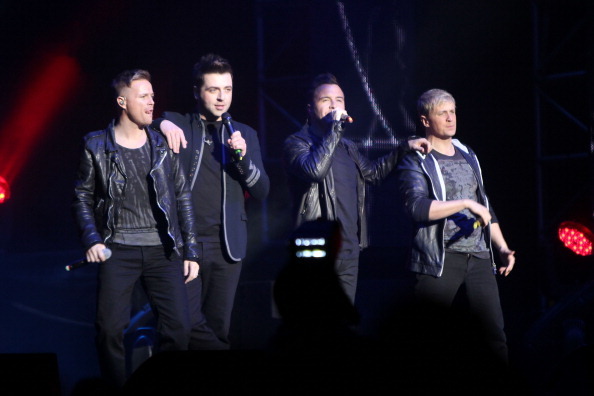 But he said that it's all to do with timing and his first loyalties will always lie with Westlife as the four lads gear up to embark on a short tour next month of South Africa and South East Asia. "I'm not going to lie -- broadcasting is something I do enjoy," he continued. "Nobody has offered me the job or anything like that but it's always nice to be mentioned in a big TV show like that. I don't know if I have the timing for something like this." Once their next tour is complete, Westlife will be taking to the stage at the O2 Dublin on November 24 to play 'O2 SmartSounds'. A live social-media gig, it will see attendees being able to request the songs they'd like to hear on the night. "We're really looking forward to that. It's a great concept and there's also going to be a battle of the bands on the night," Nicky added.